Airedale HVAC manages a set of technicians that take care of installations rather than leaving that task up to third party technicians. That means that purchasing Airedale equipment results in a top-notch installation and equipment that’s being used exactly as intended. There’s nobody more qualified to put in Airedale equipment than members of the actual company. Not only do Airedale HVAC employees and technicians help with installations, there are also service plans available to keep equipment running properly. Customers receive a 25% discount on any spare parts needed to keep equipment running when they rely on a service plan, and they also get to enjoy continued support from Airedale to make sure that everything is running properly. When you’re relying on cooling equipment to keep your computers and other sensitive equipment running properly, it makes a lot of sense to invest in the best service and maintenance that you can get to keep the coolers running. Airedale is a top cooling source for IT companies looking for a way to keep equipment cool on a large scale. Whether your business needs a few units to help manage heat produced by a small server bank, or a large scale solution to maintain thousands of servers, Airedale can give you what you need. Careful installation and extended service plans help ensure that all the equipment continues running properly long after the installation. Unlike most heating and cooling companies out there, Airedale doesn’t focus on a wide range of products. Instead, the company only offers central air unit cooling central air unit cooling solutions and accessories for those solutions such as controllers. By focusing in on one area, the company is able to create equipment at the top of the industry and has become a leading name in air conditioning. Airedale creates a full line of precision air conditioners. 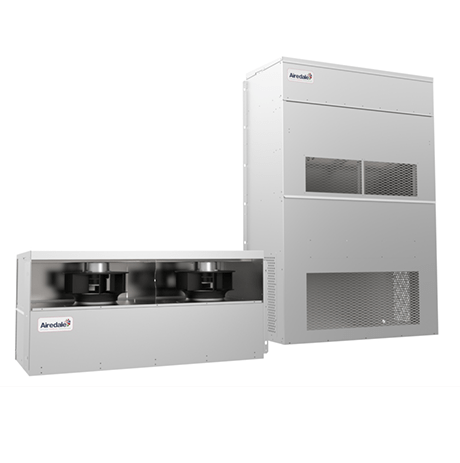 These HVAC units are designed to keep rooms at exact temperatures no matter what the outside conditions are like. They’re made for delicate applications such as in data centers or telecom buildings, but they also work in medical settings and any location where precise temperatures are important. The units aren’t cheap but they are efficient. Most of these cooling units rely on a combination of chilled water, cool air and a heat pump to achieve cool temperatures. By using several methods to achieve cooling the units can operate more efficiently and maintain temperatures no matter what’s going on. It doesn’t matter if it’s 100 degrees outside, as long as enough units are installed they’ll keep the space chilled down to where it needs to be. Massive server rooms and computer warehouses produce huge amounts of heat over time. This heat is uncomfortable to be in and it’s bad for the equipment. To prevent heat from building up too high it has to be vented out and cool air has to be moved into the room. That’s precisely what Airedale makes possible. The company offers a variety of IT cooling solutions designed to keep up with the heat production of some of the largest computer setups in the world. Airedale produces a product known as OnRak that actually collects the heat produced by a single server and then creates all the cooling necessary to keep the server at a comfortable temperature. The system mounts right where the server is and it’s simple to add this solution for each server that’s added making it expandable for a growing business. Chillers won’t necessarily run at full capacity all the time. There are going to be times of the year when it’s colder outside and cooling equipment simply doesn’t require as much effort or energy. When that’s the case, the chiller might only run at 10% or 20% of full capacity. During these times it’s important that the system isn’t running too inefficiently. That’s why chillers from Airedale are designed to run efficiently even at much lower than full capacity. It allows the units to keep the temperature right where it is supposed to be, and it helps save the company money at the same time. When implementing cooling units on a massive scale it’s important that the control solution makes them manageable. Airedale HVAC offers AHU controls, Dry cooler and Adiabatic control panels and Cassette unit controls. These large control panels tie to multiple units and offer a way for technicians to adjust settings on a wide scale. The control units tie into central panels that make adjusting all the settings of the units simple and easy. They also monitor air quality and CO2 levels for safety.